St Mirren manager Gus MacPherson has revealed that midfielder Mark Corcoran has agreed a pre-contract deal with former club Hamilton Academical. MacPherson also fears he will lose defender David van Zanten under freedom of contract. 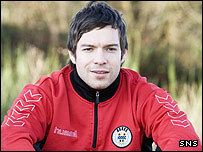 However, experienced striker Jim Hamilton is staying on with the Paisley club for next season. "Jim has done extremely well for us since coming here in January," MacPherson told the club website. The much-travelled 32-year-old has scored once in 11 appearances for the Buddies. MacPherson is disappointed to lose Corcoran, who arrived at Love Street from the Accies three years ago. "Mark feels that opportunities have been limited for him here and that he is more likely to get a regular game with Hamilton. "We wanted to keep Mark and we offered him a new contract some time ago but for one reason or other the process dragged on." Van Zanten has been with St Mirren for almost five years and MacPherson is worried the 25-year-old will be moving on. "I just feel that with a good offer on the table for a fair time now that it is unlikely that David will stay with us beyond this season. "It isn't by any means certain but for me it's a gut feeling and they very rarely let you down."